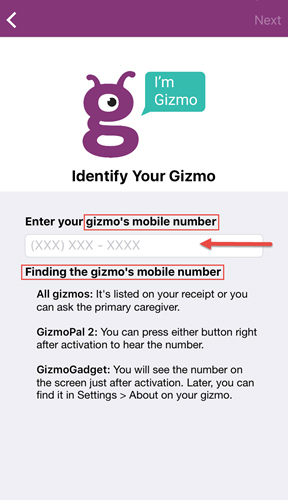 If you do not enter the mobile numbers for both the GizmoGadget and the caregiver/contact's smartphone in the appropriate steps, you can't contact your GizmoGadget from your smartphone. 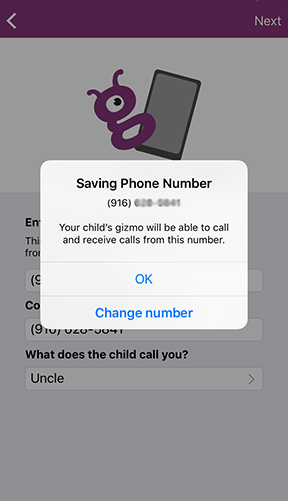 During the setup process, enter the GizmoGadget's mobile number then tap Next. 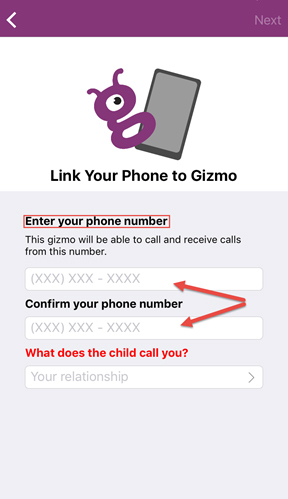 The GizmoGadget's mobile number will be the first number you enter; the number of your smartphone is entered in the next step. Enter the mobile number of the Smartphone you are currently using for the setup process then enter again to confirm. Your phone number may auto-populate in the first entry field; if so, just enter in the next field to confirm. Tap Your relationship then choose the best option from the list. Tap Next (located in the upper-right). Follow the remaining on-screen steps to activate and link the GizmoGadget to your Smartphone.